Gray or white hair is a natural phenomenon in older person but premature graying of hair is an abnormal condition and turn your black hair into older looking white hair. One of the main reason of graying hair is lack of certain nutrients which require for proper growth and nourishment of hair.When hair follicles don't get essential nutrients they stop to produce melanin pigment and hair colour turn into gray or white. Vitamin B12 deficiency also results in premature graying of hair. Deficiency of iron, zinc, iodine and copper also responsible for premature greying of hair. Excessive prolonged stress, anxiety and tension also contribute for premature graying of hair. Mental stress induces secretion of hormones which cause tension in the skin and reduce supply of vital nutrients to hair follicles leading to premature graying of hair. Excessive intake of alcohol, tea, coffee, junk and processed foods also cause premature graying of hair because all of them accelerate aging by increasing the oxidative stress and results in loss of hair colors. Smoking is also responsible for premature greying of hair because it shrinks the blood vessels and interferes with the steady flow of blood and reduces the flow of important nutrients to the hair follicles. Sever illness like typhoid too can start greying of hair. Thyroid disorders such as Grave's disease, Hashimoto's disease, hyperthyroidism, and hypothyroidism also have been linked with premature gray hair. Early Menopause in female also results in premature greying of hair. Washing the hair with hot water and the use of a dryer for drying hair may also cause premature grey hair. Some hereditary Factors also responsible for premature greying of hair. So if your father's or grandfather's hair started early to turn grey, there is a chance that your will also have premature greying of hair. Massage your scalp and hair with butter made from cow milk twice a week. 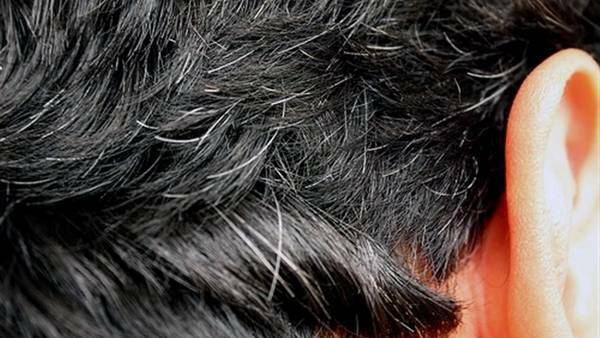 It simple home remedy is proved very effective in treatment of premature grey hair. Boil a handful of fresh curry leaves in some coconut oil until they become charred. Strain the oil and massage it into your hair and pay special attention to hair roots. Leave it on for 30 to 45 minutes before rinsing it out. Repeat this process at least twice a week. For treatment of premature greying hair you can mix 1 tablespoon of table salt to a cup of strong black tea without milk. Let it cool down for few minutes and then massage this water on the scalp. Wash your hair after an hour. Repeat this process twice a week. Onion juice is also considered very effective to cure premature graying of hair. According to recent studies gray hair are usually causes by buildup of hydrogen peroxide at the base of the hair follicles and a decrease in a natural antioxidant compound, called catalase. Onion juice promotes the production of this compound and helps a lot in treatment of premature graying hair. Apply onion juice onto your scalp, massage, and leave it on for about 30-45 minutes before washing hair. For best results, repeat this process on a daily basis. A mixture of coconut oil and lemon juice has been shown excellent results in getting rid of gray hair. This mixture not only helps in getting rid of hair hair but also moisturizes your hair, stimulates hair growth, fights infections, and adds shine to your hair. According to your hair length, take some coconut oil and mix with equal amount lemon juice. Apply it to your hair and massage it into your scalp. Let it stay for 30 minutes before shampooing your hair. Repeat this process twice a week. Henna leaves act as an excellent natural hair colorant, not only help in making your hair darker but also strengthen your hair. Henna leave along with some other natural ingredients have been shown excellent results in getting rid of gray hair. Grind a handful of henna leaves into a paste. Add 1 tablespoon of Indian gooseberry powder, one teaspoon of coffee powder and 1 tablespoon of plain yogurt. Mix them well to make a smooth paste and spread it evenly on your hair. Let it stay for one hour and until it dries. Finally rinse it out and then wash your hair by using your regular shampoo. Repeat the process twice a week. Gooseberry(Amla) is considered very effective to cure many hair problems including grey hair and hair fall problem. Regular massage of Gooseberry(Amla) paste rubbed into the scalp has worked wonders in many cases and reverse the process of greying hair. To cure the problem of gray hair, boil some dried gooseberry(amla) pieces in coconut oil till it turns black. Let it cool down and apply this oil to your hair and scalp to prevent hair greying. An other way to cure the problem of gray hair is a combination of dried gooseberry, fenugreek and coconut oil. Take 4-5 pieces of dried amla, 1 tablespoon of fenugreek seeds powder and about 1/2 cup of coconut oil. Heat the coconut oil and add the amla pieces to it, let it boil for 5 to 6 minutes and then add the fenugreek powder to the oil. Let it boil for another minute and remove from flame. Let it cool and strain the oil. Apply on scalp and hair and massage for few minutes. Let it stay for few hours and then wash off. Being a rich source of antioxidant vitamin E, almond oil not only acts a natural remedy for treating wrinkles, fine lines and age spots but also helps a lot to prevents premature greying of hair. In addition to cure premature gray hair, almond oil massage nourishes the roots of the hair, improves elasticity and prevents split ends. Almond oil along with lemon juice and amla juice is highly beneficial in getting rid of premature gray hair. According to your hair length, take equal amounts of almond oil, lemon juice, and amla juice. and Mix them well massage your hair with this mixture to cure the problem of grey hair. Let it stay on your hair at least for one hour and then wash your hair by using regular shampoo. Grate some fresh ginger. Mix with honey and place it in a jar. Eat 1 teaspoon everyday.This is also considered very helpful for treatment of grey or white hair. Taking sufficient amount of yogurt about one cup (250g) daily and a tablespoon of yeast before meals is very helpful in prevention and treatment of premature white hair. Try to consume nutrients rich foods to prevent premature graying of hair. Eat foods rich in vitamin A, B, and minerals like zinc, copper, iodine and iron. Good Sources of Vitamin A are dark green vegetables , yellow fruits and vegetables such as broccoli spinach, turnip greens, carrots, squash, sweet potatoes, pumpkin, cantaloupe, and apricots, and in animal sources such as liver, milk, butter, cheese, and whole eggs. Good sources of Vitamin B are fresh green leafy vegetables, bananas, tomatoes, cauliflower, cereals, liver, kidney, yogurt, yeast and wheat germ. Good Sources of zinc include red meat, chicken & green vegetables. Best Sources of iron include beef, dried apricots, red meat, parsley, eggs, wheat & sunflower seeds. Best Sources of Copper are sunflower seeds, cashews, almonds, crabs and oysters, egg yolk & whole grains. Best Sources of iodine are banana, carrots and fish but avoid excessive intake of Iodine because heavy intake of iodine adversely affect thyroid gland and may cause premature greying of hair. (ii)Avoid excessive exposure to the UV Sunlight. (iii)Avoid smoking, drinking alcohol any kind of drug intake. (iv)Avoid chemical hair dyers which may damage the structure of hair follicles. (v)After Bath avoid very hot electric hair dryers. (vi)Avoid excessive intake of tea, coffee, soft drinks, junk and processed foods. (vii) Avoid foods made from refined sugar and sugary products including candies, pastries, jams and jelly.